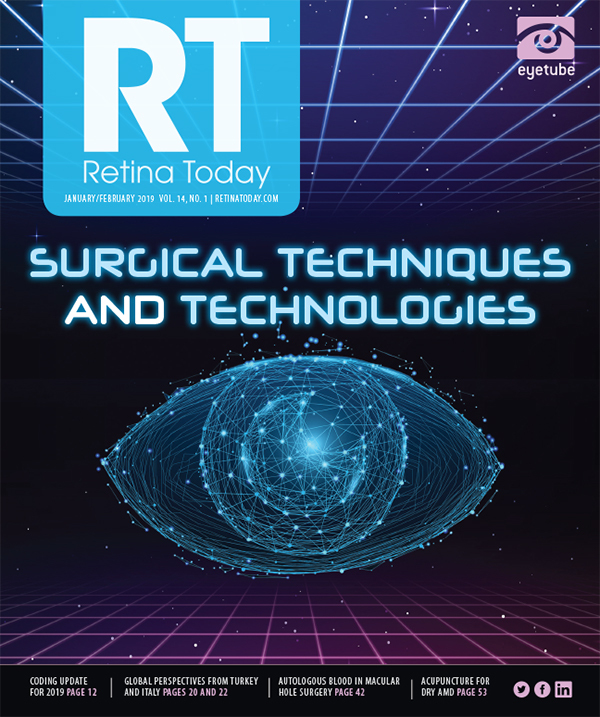 As management options for retinoblastoma have expanded, so too has the decision-making tree for treatment.1 One hundred years ago, the choice was simple: enucleation or death. At that time, 100% of children with unilateral retinoblastoma were enucleated, and some were also exenterated. • Treatments for pediatric retinoblastoma have improved greatly over the past decade, resulting in a massive reduction of enucleation rates. • We examine five cases in which, thanks to new treatments, the likelihood of enucleation has been reduced. Reese and colleagues, followed by Ellsworth and Abramson and colleagues,3,4 cautiously began treating bilateral retinoblastoma with bilateral radiation and unilateral retinoblastoma with techniques other than primary enucleation.5 When it was recognized that external beam radiation, which saved life, eyes, and vision, also contributed to the development of secondary neoplasms, physicians had to weigh the immediate benefits against the longer-term effects. The consequence of radiation was to shorten lifespan—although it was a life with eyes and vision—because of the lethality of the secondary cancers. The development of xenon arc photocoagulation by Meyer-Schwickerath, cryotherapy by Lincoff, brachytherapy by Stallard, and diode laser photocoagulation by Murphree expanded treatment options but also further increased the complexity of the treatment decision-making process. For example, a small tumor in the macula of one eye could be managed with enucleation, which would be good for cancer management but bad for the eye and vision; cryotherapy or laser, which would be good for cancer management and ocular salvage but bad for vision; or the use of systemic chemotherapy with the hope that the tumor would pull away from the fovea and allow regaining of sight, which would be good for cancer management, ocular salvage, and vision. Additionally, the clinician also had to factor in the toxicity and costs of chemotherapy. Permanent hearing loss, neutropenic fever, transfusion of blood products, port insertion (and possible infection), and chemotherapy-induced secondary cancers, which were often fatal, were all potential consequences of trying to salvage vision. As these options for treatment evolved during the 20th century, the options for management evolved along with them. Everything changed with the introduction of intraarterial chemotherapy in 20066 and then intravitreal chemotherapy injections in 2010.7 Clinicians now had powerful tools, with less but different toxicities, for managing eyes and situations never encountered before. In this article we present five cases of retinoblastoma that, at one time, could not be managed without enucleation. We hope to demonstrate how such eyes can be saved with modern management. Figure 1. In a 1-year-old child with bilateral retinoblastoma, the right eye was enucleated and the left eye was treated with systemic chemotherapy and laser; a speckled, elevated mass with secondary detachment developed (A). Intrarterial chemotherapy with melphalan, topotecan and carboplatin had a prompt and lasting response without visual compromise (B). A 1-year-old child presented with bilateral retinoblastoma. The right eye was enucleated. The left eye was treated with systemic chemotherapy and laser (Figure 1A). A speckled, elevated mass with secondary detachment developed below. This is choroidal invasion. The child has only one eye. Should you enucleate? In the past, choroidal invasion was thought to be a high-risk event for children with retinoblastoma. Not only did many centers treat children with multiagent systemic chemotherapy, but, further, some experts recommended removal of the eye to determine whether choroidal invasion was present. It is now recognized that isolated choroidal invasion is not a high-risk event and that treatment with modest doses of intravenous chemotherapy may induce resistance in patients with underlying micrometastatic disease. This patient received intraarterial chemotherapy with melphalan, topotecan, and carboplatin, which had a prompt and lasting response without compromising visual function (Figure 1B). No systemic metastases have developed after 2 years of follow-up. Figure 2. A 4-month-old boy received repeated sessions of systemic chemotherapy for a posterior pole tumor, but the original lesion grew (A). Intraarterial chemotherapy resulted in complete and lasting resolution of the recurrence and shrinkage of the tumor without visual compromise (B). A 4-month-old boy was seen after repeated sessions of systemic chemotherapy for a posterior pole tumor (Figure 2A). At the completion of chemotherapy, the original lesion grew. Is there anything to offer besides enucleation? Recurrent disease after multiagent systemic chemotherapy has usually required enucleation. Small recurrences can be managed with laser or cryotherapy. External beam radiation has been used in the past, but it carries with it a high risk of vascular compromise and vitreous hemorrhage affecting vision and the visibility of the tumor. Although brachytherapy can be used, children who have received systemic chemotherapy followed by plaque radiotherapy often have devastating complications as a result of vascular damage. This child received intraarterial chemotherapy, resulting in complete and lasting resolution of the recurrence and shrinkage of the tumor without visual compromise (Figure 2B). Figure 3. A 3-year-old boy had good vision despite a peripheral retinoblastoma with extensive overlying seeds (A). Localized cryotherapy followed by intraarterial chemotherapy and intravitreal chemotherapy with melphalan resulted in complete resolution of the seeds and tumor without compromise of visual function (B). A 3-year-old boy was seen with a peripheral retinoblastoma with extensive overlying seeds and good vision (Figure 3A). Should you enucleate? Solitary peripheral tumors in older children are difficult to cure without enucleation. Often, as in this case, what appears to be a solitary tumor is actually a cloudlike collection of seeds aggregating to simulate a cohesive solitary tumor; the underlying tumor causing this pseudomass may be small and curable. It is now recognized that all vitreous seeds are not alike; their clinical appearance, the clinical situations in which they develop and their response to treatment are distinct.8,9 This child received localized cryotherapy to increase the efficacy of chemotherapy treatment followed by intraarterial chemotherapy and intravitreal chemotherapy with melphalan. Complete resolution of the seeds and tumor was attained without compromising visual function (Figure 3B). Figure 4. In a 4-month-old child with bilateral retinoblastoma, the right eye had large “kissing” tumors obscuring the optic nerve head and fovea (A). Intraarterial chemotherapy with melphalan, topotecan, and carboplatin, in addition to laser, resulted in final VA of 20/40 (B). A 4-month-old child was diagnosed with bilateral retinoblastoma. The left eye was enucleated. The right eye (Figure 4A) had large “kissing” tumors obscuring the optic nerve head and fovea. Should you perform bilateral enucleation? The child received intraarterial chemotherapy (melphalan, topotecan, and carboplatin) in addition to laser. Final VA was 20/40 (Figure 4B). A 10-month-old child presented with bilateral retinoblastoma. The left eye had no light perception, an afferent pupillary defect, and an extinguished 30 Hz flicker electroretinogram (ERG) (Figure 5A). Should the right eye be enucleated? Figure 5. In a 10-month-old child with bilateral retinoblastoma, the left eye had no light perception, an afferent pupillary defect, and an extinguished 30 Hz flicker ERG (A). After two rounds of intraarterial chemotherapy, the retina settled down, ERG improved to 60% of normal, and VA returned to 20/60 (B). In the past, eyes with no vision, afferent pupillary defects, and extinguished ERGs were deemed hopeless. It was thought that no treatment other than enucleation was justified because of the toxicity of the treatments available. In this case, after two rounds of intraarterial chemotherapy the retina quickly settled down, the ERG improved to 60% of normal, and VA returned to 20/60 (Figure 5B). The fellow eye was blind. Seven years later, this child functions independently. 1. Abramson DH. Retinoblastoma: saving life with vision. Annu Rev Med. 2014;65:171-184. 2. Reese AB, Merriam GR, Martin HE. Treatment of bilateral retinoblastoma by irradiation and surgery; report on 15-year results. Am J Ophthalmol. 1949;32(2):175-190. 3. Abramson DH, Ellsworth RM, Tretter P, Javitt J, Kitchin FD. Treatment of bilateral groups I through III retinoblastoma with bilateral radiation. Arch Ophthalmol. 1981;99(10):1761-1762. 4. Abramson DH, Ellsworth RM, Tretter P, Adams K, Kitchin FD. Simultaneous bilateral radiation for advanced bilateral retinoblastoma. Arch Ophthalmol. 1981;99(10):1763-1766. 5. Abramson DH, Marks RF, Ellsworth RM, Tretter P, Kitchin FD. The management of unilateral retinoblastoma without primary enucleation. Arch Ophthalmol. 1982;100(8):1249-1252. 6. Abramson DH, Dunkel IJ, Brodie SE, Kim JW, Gobin YP. A phase I/II study of direct intraarterial (ophthalmic artery) chemotherapy with melphalan for intraocular retinoblastoma initial results. Ophthalmology. 2008;115(8):1398-1404.e1. 7. Munier FL, Gaillard MC, Balmer A, et al. Intravitreal chemotherapy for vitreous disease in retinoblastoma revisited: from prohibition to conditional indications. Br J Ophthalmol. 2012;96(8):1078-1083. 8. Francis JH, Abramson DH, Gaillard MC, Marr BP, Beck-Popovic M, Munier FL. The classification of vitreous seeds in retinoblastoma and response to intravitreal melphalan. Ophthalmology. 2015;122(6):1173-1179. 9. Francis JH, Brodie SE, Marr B, Zabor EC, Mondesire-Crump I, Abramson DH. Efficacy and toxicity of intravitreous chemotherapy for retinoblastoma: four-year experience. Ophthalmology. 2017;124(4):488-495. 10. Abramson DH, Shields CL, Jabbour P, et al. Metastatic deaths in retinoblastoma patients treated with intraarterial chemotherapy (ophthalmic artery chemosurgery) worldwide. Int J Retina Vitreous. 2017;;3:40. 11. Francis JH, Abramson DH, Ji X, et al. Risk of extraocular extension in eyes with retinoblastoma receiving intravitreous chemotherapy. JAMA Ophthalmol. 2017; 135(12):1426-1429. 12. Abramson DH, Fabius AWM, Issa R, et al. Advanced unilateral retinoblastoma: the impact of ophthalmic artery chemosurgery on enucleation rate and patient survival at MSKCC. PLoS One. 2015;10(12):e0145436.